Department of Social Psychology University of Jaén, Jaén, Spain. Received January 10th, 2010; revised February 3rd, 2010; accepted February 4th, 2010.
emotional states show higher levels of overall health than those individuals who have trouble regulating their emotions. and growth of the profession . Repair) in several areas of research in the field of nursing. show less anxiety when faced with death . and negatively related to anxiety and depression. stress, burnout and attribution [21-23]. 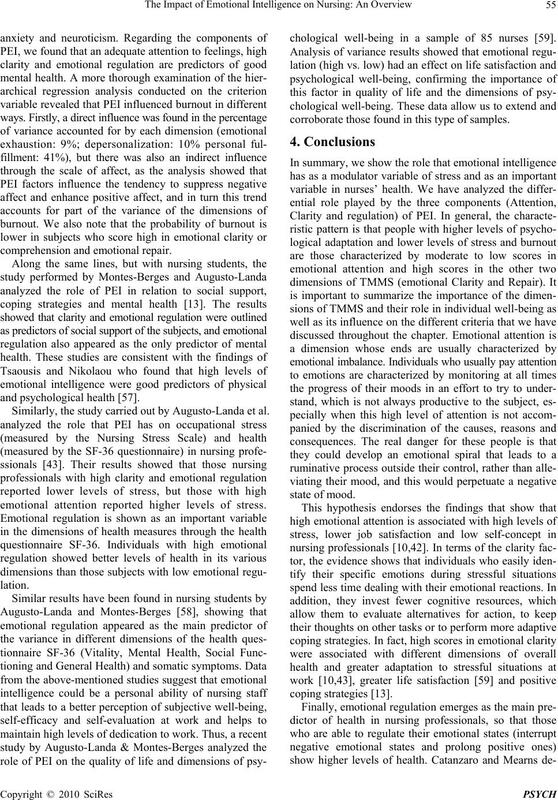 ability to regulate their own emotions and tho se of others. attitude towards their patients and tended to avoid them. Depersonalization and 3) Personal Accomplishment. with individuals whose work deal with (patients, students). tionship wit h the peo pl e th ey serve. consequences, and when they fail, the problem continues. tion of the phe nomenon . negative consequences that this entails for their health. gence or inability, and night work. emotional exhaustion, which is a component of burnout. treatment, problems with hierarchy and lack of support. responses to differ en t stresso rs. low score in this variable. work in harmony with their thoughts and feelings . of involvement empathy (one dimension of the IRI) . emotional regulation reported greater personal fulfillment. affect) accounted for part of the variance in mental health. and psychological health [57 ]. Similarly, the study carried out by Augusto-Landa et al. 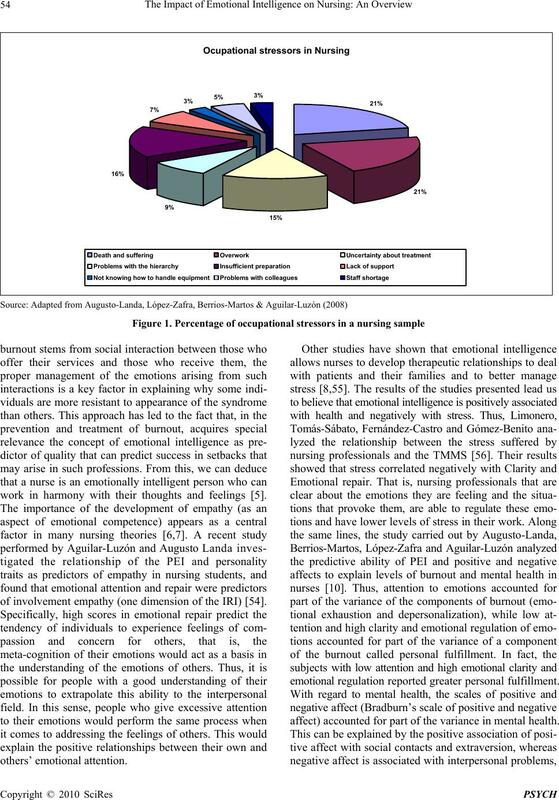 emotional attention reported higher levels of stress. chological well-being in a sample of 85 nurses . corroborate those found in this type of samples. both in students and nurses. in the dimension of emotional intelligence is essential. 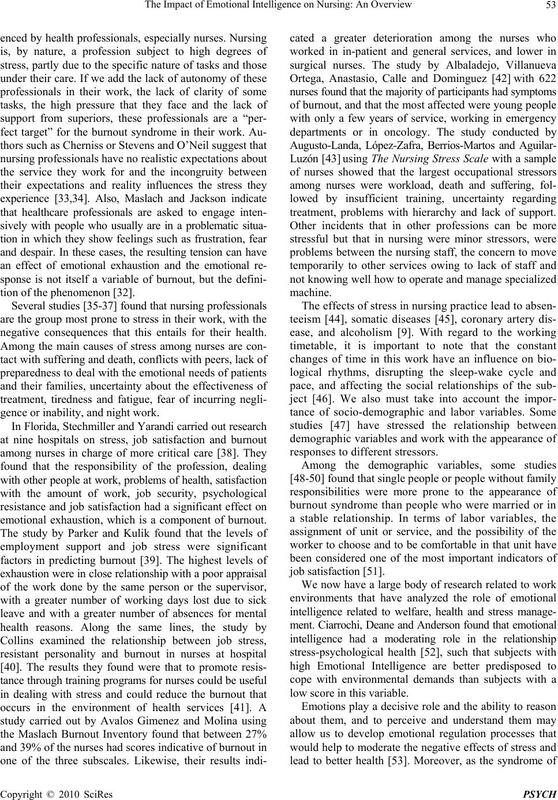 Journal of Nursing Research, Vol. 23, No. 3, 2001, pp. 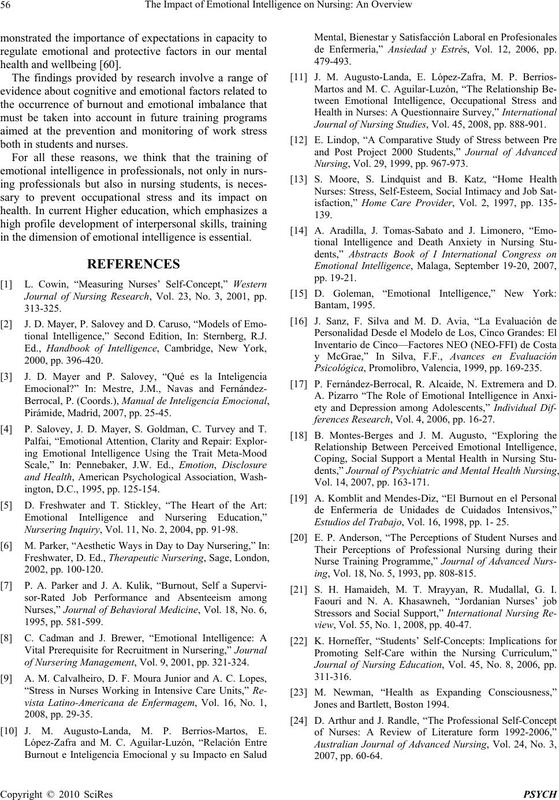 tional Intelligence,” Second Edition, In: Sternberg, R.J.
Pirámide, Madrid, 2007, pp. 25-45. P. Salovey, J. D. Mayer, S. Goldman, C. Turvey and T.
ington, D.C., 1995, pp. 125-154. Nursering Inquiry, Vol. 11, No. 2, 2004, pp. 91-98.
of Nursering Management, Vol. 9, 2001, pp. 321-324. J. M. Augusto-Landa, M. P. Berrios-Martos, E.
de Enfermería,” Ansiedad y Estrés, Vol. 12, 2006, pp. Journal of Nursing Studies, Vol. 45, 2008, pp. 888-901. Nursing, Vol. 29, 1999, pp. 967-973. Psicológica, Promolibro, Valencia, 1999, pp. 169-235. P. Fernández-Berrocal, R. Alcaide, N. Extremera and D.
ferences Research, Vol. 4, 2006, pp. 16-27. Vol. 14, 2007, pp. 163-171. Estudios del Trabajo, Vol. 16, 1998, pp. 1- 25.
ing, Vol. 18, No. 5, 1993, pp. 808-815. S. H. Hamaideh, M. T. Mrayyan, R. Mudallal, G. I.
view, Vol. 55, No. 1, 2008, pp. 40-47. 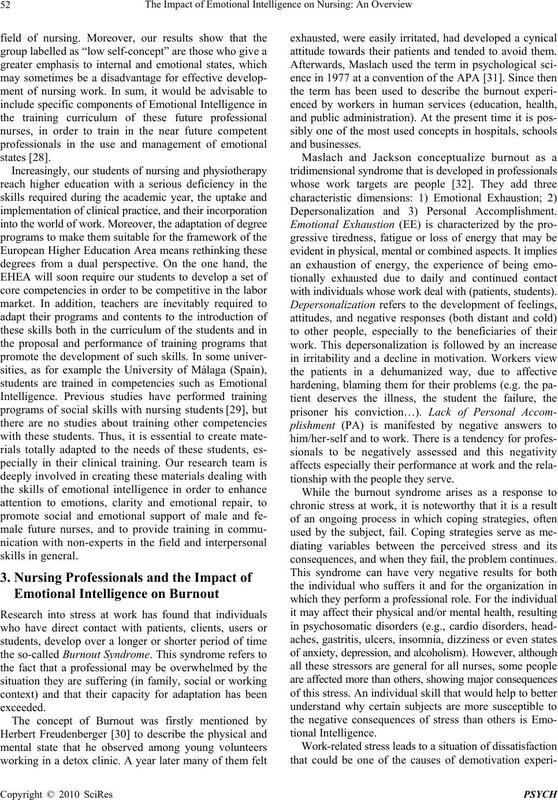 Journal of Nursing Education, Vol. 45, No. 8, 2006, pp. Jones and Bartlett, Boston 1994. 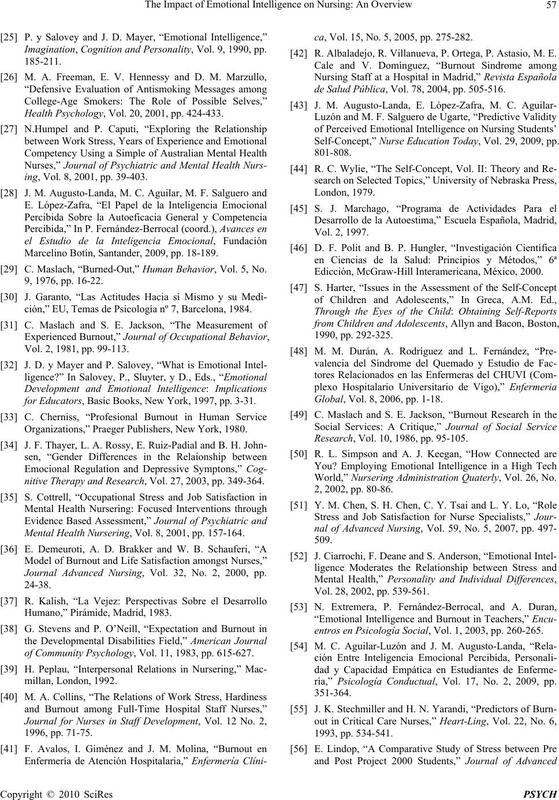 Imagination, Cognition and Personality, Vol. 9, 1990, pp. Health Psychology, Vol. 20, 2001, pp. 424-433.
ing, Vol. 8, 2001, pp. 39-403. Marcelino Botín, Santander, 2009, pp. 18-189. C. Maslach, “Burned-Out,” Human Behavior, Vol. 5, No. ción,” EU, Temas de Psicolog ía nº 7, Barcelona, 1984. Vol. 2, 1981, pp. 99-113.
for Educators, Basic Books, New York, 1997, pp. 3-31. Organizations,” Praeger Publishers, New York, 1980.
nitive Therapy and Research, Vol. 27, 2003, pp. 349-364. Mental Health Nursering, Vol. 8, 2001, pp. 157-164. Journal Advanced Nursing, Vol. 32, No. 2, 2000, pp. of Community Psychology, Vol. 11, 1983, pp. 615-627.
ca, Vol. 15, No. 5, 2005, pp. 275-282. R. Albaladejo, R. Villanueva, P. Ortega, P. Astasio, M. E.
de Salud Pública, Vol. 78, 2004, pp. 505-516. 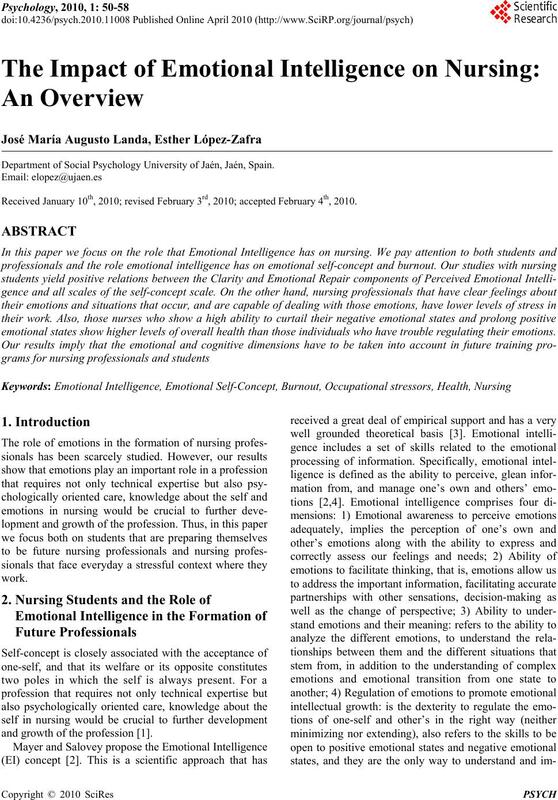 Self-Concept,” Nurse Education Today, Vol. 29, 2009, pp. Edicción, McGraw-Hill Interamericana, México, 2000. Global, Vol. 8, 2006, pp. 1-18. Research, Vol. 10, 1986, pp. 95-105. 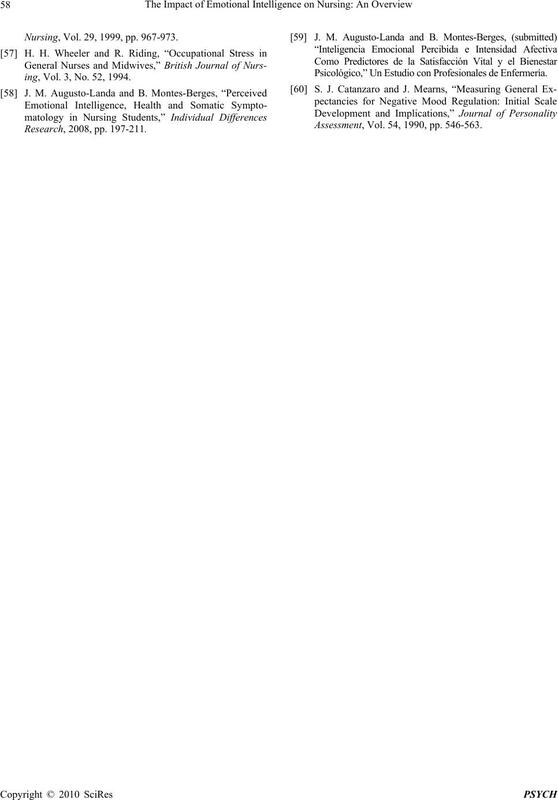 World,” Nursering Administration Quaterly, Vol. 26, No. Vol. 28, 2002, pp. 539-561.
entros en Psicología Social, Vol. 1, 2003, pp. 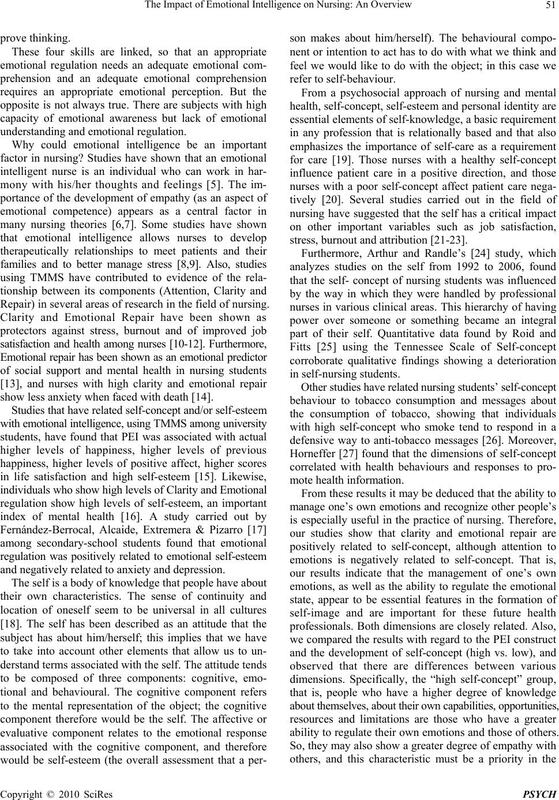 260-265.
ría,” Psicología Conductual, Vol. 17, No. 2, 2009, pp. ing, Vol. 3, No. 52, 1994. Psicológico,” Un Estudio con Profesionales de Enfermería. Assessment, Vol. 54, 1990, pp. 546-563.